“This is the best application for golf I have ever used...Finally an application that has more than just 5,000 courses mapped! Join the Clubhouse Now Its FREE! GolfLogix provides the User with a golf community website that includes golf round statistic tracking and analysis and social media services. In addition, GolfLogix allows the User to download the GolfLogix application to a compatible Smartphone to track golf statistics, provide golf course distances and other features related to playing a round of golf. To utilize both GolfLogix’ Product and Service, Users must provide (1) all equipment necessary for their own Internet connection, including computer and modem, (2) provide cell phone service including data services and (3) pay any fees relate with such connections and services to the individual carriers. 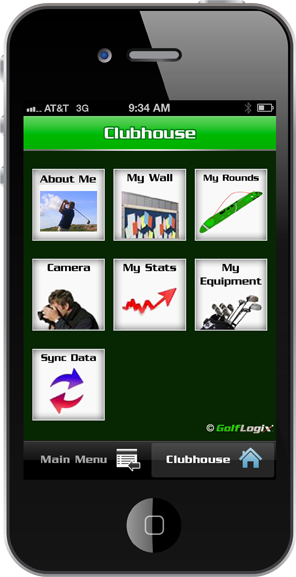 Some GolfLogix applications provide a mobile application for free. Please be aware that a User’s normal carrier's rates and fees, such as text messaging fees, will apply. The user is responsible for any additional charges that may be incurred through the User’s carrier. In the event you change or deactivate your mobile service, Users are responsible for updating or canceling all account information on the GolfLogix website within 14 days to ensure proper communication and billing. GolfLogix does not charge any fee for the User to participate in the GolfLogix community website Service. The User can opt to download the Smartphone application Product at no charge and be a Club Member at no charge. The User may opt, at their discretion, to upgrade to a Champion Member whereby annual dues will be specified and paid in advance by credit or debit card. Champion Members payment is due annually on the anniversary of the date of membership and membership dues will continue unless a User cancels their membership by contacting GolfLogix’ Customer Service via phone, email or in writing. The User will be charged at the rate in effect at the time of renewal. A Champion Membership can be cancelled, terminated or discontinued by the User or GolfLogix, at its sole discretion, at any time. The User is responsible for notifying GolfLogix of any change in name, billing address, email, telephone, credit card or other account information to insure uninterrupted service. To cancel GolfLogix service, the User must contact GolfLogix’ customer support department at 1-877-977-0162 or email: support@golflogix.com. GolfLogix reserves the right to change membership fees and other charges at any time with or without prior notice. The Service and Product are provided by GolfLogix on an ‘as is’ and on an ‘as available’ basis. To the fullest extent permitted by applicable law, GolfLogix makes no representations or warranties of any kind, express or implied, regarding the use or the results of the Service and Product in terms of its correctness, accuracy, reliability, or otherwise. GolfLogix shall have no liability for any interruptions in the use of the Product or Service. GolfLogix disclaims all warranties with regard to the information provided, including the implied warranties of merchantability and fitness for a particular purpose, and non-infringement. Some jurisdictions do not allow the exclusion of implied warranties; therefore the above-referenced exclusion is inapplicable. GolfLogix does not warrant that its Product or Service will operate error-free or that its application, website and server are free of computer viruses and other harmful goods. If the User’s use of GolfLogix Product or Service results in the need for servicing or replacing equipment or data, GolfLogix is not responsible for those costs. GOLFLOGIX SHALL NOT BE LIABLE FOR ANY DAMAGES WHATSOEVER, AND IN PARTICULAR GOLFLOGIX SHALL NOT BE LIABLE FOR ANY SPECIAL, INDIRECT, CONSEQUENTIAL, OR INCIDENTAL DAMAGES, OR DAMAGES FOR LOST PROFITS, LOSS OF REVENUE, OR LOSS OF USE, ARISING OUT OF OR RELATED TO THIS WEBSITE OR THE INFORMATION CONTAINED IN IT, WHETHER SUCH DAMAGES ARISE IN CONTRACT, NEGLIGENCE, TORT, UNDER STATUTE, IN EQUITY, AT LAW, OR OTHERWISE, EVEN IF GOLFLOGIX HAS BEEN ADVISED OF THE POSSIBILITY OF SUCH DAMAGES. SOME JURISDICTIONS DO NOT ALLOW FOR THE LIMITATION OR EXCLUSION OF LIABILITY FOR INCIDENTAL OR CONSEQUENTIAL DAMAGES, THEREFORE SOME OF THE ABOVE LIMITATIONS ARE INAPPLICABLE. Users agree to indemnify and hold GolfLogix, its parents, subsidiaries, affiliates, officers and employees, harmless from any claim or demand, including reasonable attorneys’ fees and costs, made by any third party due to or arising out of User’s use of the Service, the violation of this Agreement, or infringement by a User, or other User of the Service using a GolfLogix membership privilege, of any intellectual property or any other right of any person or entity. Users agree to not use the Service to: (i) upload, post, email or otherwise transmit any content that is unlawful, harmful, threatening, abusive, harassing, tortuous, defamatory, vulgar, obscene, libelous, invasive of another's privacy, hateful, or racially, ethnically or otherwise objectionable; (ii) harm minors in any way; (iii) impersonate any person or entity, including, but not limited to, a GolfLogix official, forum leader, guide or host, or falsely state or otherwise misrepresent User’s affiliation with a person or entity; (iv) forge headers or otherwise manipulate identifiers in order to disguise the origin of any content transmitted through the Service; (v) upload, post, email or otherwise transmit any content that User does not have a right to transmit under any law or under contractual or fiduciary relationships (such as inside information, proprietary and confidential information learned or disclosed as part of employment relationships or under nondisclosure agreements); (vi) upload, post, email or otherwise transmit any content that infringes any patent, trademark, trade secret, copyright or other proprietary rights ("Rights") of any party; (vii) upload, post, email or otherwise transmit any unsolicited or unauthorized advertising, promotional materials, "junk mail," "spam," "chain letters," "pyramid schemes," or any other form of solicitation, except in those areas (such as a marketplace or classifieds) that are designated for promotional purpose; (viii) upload, post, email or otherwise transmit any material that contains software viruses or any other computer code, files or programs designed to interrupt, destroy or limit the functionality of any computer software or hardware or telecommunications equipment; (ix) disrupt the normal flow of dialogue or otherwise act in a manner that negatively affects other users' ability to engage in real time exchanges; or (x) interfere with or disrupt the Service or servers or networks connected to the Service, or disobey any requirements, procedures, policies or regulations of networks connected to the Service. GolfLogix shall have the right, but not the obligation, to monitor the content of the GolfLogix website, including chat rooms and forums, to determine compliance with this Agreement and any operating rules established by GolfLogix and to satisfy any law, regulation or authorized government request. GolfLogix shall have the right in its sole discretion to edit, refuse to post or remove any material submitted to or posted on the GolfLogix website. GolfLogix reserves the right to modify or discontinue the Service and Product with or without notice to a User. GolfLogix shall not be liable to a User or any third party should GolfLogix exercise its right to modify or discontinue the Service, Product, or any of the Product Features at any time. Member acknowledges and accepts that GolfLogix does not guarantee continuous, uninterrupted or secure access to our website or product and operation of our website may be interfered with or adversely affected by numerous factors or circumstances outside of our control. Product specifications and other information have either been provided by the Vendors or collected from publicly available sources. While GolfLogix makes every effort to ensure that the information on its website is accurate, we make no representations or warranties as to the accuracy or reliability of any information provided on this website. Any reliance on representations and warranties provided by any Vendor shall be at a User’s own risk. All content included or available in the GolfLogix product application and websiteincluding site design, text, graphics, golf course data/layout, interfaces, and the selection and arrangements thereof is the property of GolfLogix and/or third parties protected by intellectual property rights. Any use of materials on the websiteor application, including reproduction for purposes other than those noted above, modification, distribution, or replication, any form of data extraction or data mining, or other commercial exploitation of any kind, without prior written permission of an authorized officer of GolfLogix is strictly prohibited. Users agree that they will not use any robot, spider, or other automatic device, or manual process to monitor or copy GolfLogix web pages or the content contained therein without prior written permission of an authorized officer of GolfLogix. GolfLogix is a registered trademark of GolfLogix, Inc. GolfLogix’ trademarks may not be used in connection with any product or service that is not provided by GolfLogix, nor is it to be used in any manner that is likely to cause confusion among customers, or in any manner that disparages or discredits GolfLogix. All other trademarks displayed on GolfLogix’ website are the trademarks of their respective owners, and constitute neither an endorsement nor a recommendation of those Vendors. In addition, such use of trademarks or links to the websites of Vendors is not intended to imply, directly or indirectly, that those Vendors endorse or have any affiliation with GolfLogix. An email has been sent to the address provided with a link to activate your account. GolfLogix introduced Handheld Golf GPS to the golf market in 1999. We now lead the golf industry with the Best Golf GPS for Smartphone Golf Applications and Mobile Golf Software. Our BlackBerry Golf GPS application, iPhone Golf GPS application, and other Cell Phone Golf Distance Finder software offer golf course GPS solutions that are unmatched in the game of golf. If you are looking for a cellphone golf application, we welcome a golf GPS comparison so you can see for yourself what makes GolfLogix the best selling GPS golf software. Try our BlackBerry Curve golf GPS, BlackBerry Bold golf GPS, BlackBerry Storm golf GPS, BlackBerry Tour golf GPS, iPhone golf GPS, iPhone 3G golf GPS or the iPhone 3GS golf GPS, HTC Incredible golf GPS, HTC Evo golf GPS, Palm Pre golf GPS, Motorola Cliq golf GPS, Motorola Devour golf GPS, T-Mobile myTouch golf GPS today. If smartphone GPS golf is not for you and you prefer a handheld golf GPS rangefinder, try out our bestselling GolfLogix GPS-8 Golf GPS. Like many golfers have discovered, Golf GPS Systems are the future of the golf industry.